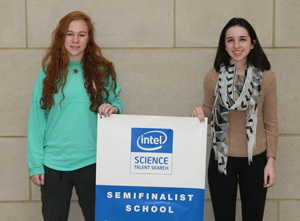 On January 7, Hathaway Brown seniors Emily Amjad and Emily Spencer were named as semifinalists in the Society for Science and the Public’s Intel Science Talent Search competition (Intel STS). The Intel STS is one of the nation’s most prestigious math and science competitions and rewards rigorous original research conducted by high school seniors. Emily Amjad was recognized for her cardiology research at Case Western Reserve University's (CWRU) School of Medicine and Emily Spencer was awarded for her polymer research at CWRU's School of Engineering. The girls are two of only five students selected in Ohio and the only private school students selected from Northeast Ohio. Emily Spencer is also the only girl in the state to be recognized by both the Siemens Foundation Competition and Intel STS for her work. As semifinalists, Amjad and Spencer each win a $1000 prize for themselves, a $1000 prize for Hathaway Brown’s SREP program, and a chance to win between $7,500 and $150,000 an all expenses paid trip to Washington D.C. in March if they are named as finalists. Congratulations to Emily Amjad and Emily Spencer on their remarkable achievement and hard work and good luck in the next round of judging!